The day of granite being the most popular countertop material may be over. Vetrazzo is revolutionizing the concept of countertops by making them stronger and environmentally friendly, by making them out of recycled glass. This stunning production takes glass from bottles, windows, traffic lights, and anything else made of glass to make a green product that is as beautiful as it is practical. 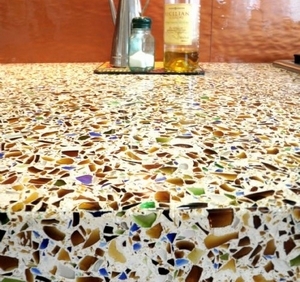 Using a glass countertop, which is about 85% glass by weight, uses material that would normally end up filling a trash heap somewhere. Now however, Vetrazzo is putting our refuse to a practical purpose. And the best part is, it uses no non-renewable resources in its construction, nor does it require cutting down vast expanses of trees. These countertops don’t require any special care, and are sanded to a glossy smooth finish that looks great in any kitchen. Custom Kitchens will provide you with a countertop from any of the lines Vetrazzo has to offer, custom fit to your cabinets. And if you fill out the contact form on this page, we’ll waive the $200 dollar design fee. Our design team will reconstruct your kitchen in 3D so you can see your new Netrazzo countertop before you even buy it. With a Vetrazzo countertop, you’ll be helping to save the environment, while owning a practical piece of kitchen artwork.